A couple of days ago one of our subscriber-investors called me with a problem. He complained that the stocks shown in the PowerOptions search results were companies he didn’t recognize and he had never traded before and wasn’t trading now. This happens often and for a whole list of reasons… We don’t know the list of stocks YOU like unless you enter them in a list… and the search tools find any stock, Index or ETF that meet the search parameters for that strategy. Don’t meet one of the Fundamental or Technical Criteria. May match those criteria, but the options don’t match the Options Criteria. Are further down the list… maybe pages down in the results. You can ‘force’ the search tools to look only for option results that are on your lists! 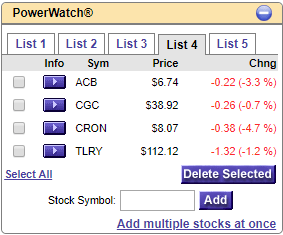 Just use the Watch LISTS tool to focus searches on stocks you’d like to see. If you are not interested in new alternative investments, you can focus on present holdings by using a list of those holdings for search. On the Home page an investor can use the PowerWatch List create up to 5 lists of stocks to watch or search against in any strategy to find option opportunities. Monitor your stocks for price changes during the day. Use the blue ‘More Info’ button to view the chart, news, earnings and more! Once you create a Watch List you can select it from the Lists tab in any strategy. This will allow you to screen against only your preferred stocks. Note: If the 5 Watchlists aren’t enough for you… there’s an unlimited number of lists you can setup expressly for your searches, they just won’t be shown in the Watchlist area. The Watch Lists can be used for a variety of purposes. This sample PowerWatch List 4 is a list of optionable marijuana stocks and focuses on a specific market sector. If you have an advisory service that has a preferred stock list of opportunities, you can paste them into the Watch Lists and screen against those stocks in any strategy as well.